Discover Sewing is proud to sponsor the Pfaff Studio at Quilting LIVE! 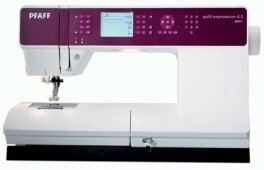 with over 20 Pfaff Quilt Expression 4.2 Sewing and Quilting Machines. These machines will only be used at the show and will be sold at great savings with a Full Warranty. Stop by one of our locations for a test drive so that you can reserve yours today.